Hypericum is one of nature’s best herbs for the entire nervous system. This herb (also known as St John’s wort) has received much medical attention and recognition, particularly for its use in mild to moderate depression and anxiety. 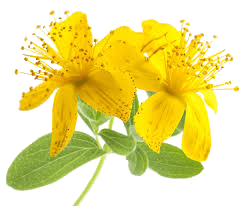 Clinical trials have now shown that hypericum is as effective as some prescription antidepressants, but does not have the uncomfortable side effects associated with prescription products. anxiety, tension, neuralgic pain, fibrositis and sciatica. It is also recommended for speech disorders, fitful sleep and sleepwalking, menopausal problems such as uterine cramping, and neurosis in children. The calming properties of this herb make it useful in the treatment of bed-wetting, bladder troubles, diarrhoea and dysentery. St John’s wort was one of the herbs under scrutiny as a possible cure for AIDS. This ties in with the plant’s ancient role of being particularly good as a healer of wounds when you consider AIDS is a breakdown of the immune system and St John’s wort contributes significantly to the body’s defence capabilities. However these studies are still in their infancy and while anyone is free to experiment with St John’s wort and the effect it has on them, if you are seriously ill, particularly with AIDS, please take the herb in consultation with your doctor. St John’s wort oil is a much-valued potion that has been used for hundreds of years as a treatment for burns, wounds, sores, bruises and other skin problems, as well as relieving sore backs, lumbago, abdominal pain, sciatica, rheumatism and glandular swelling. Babies suffering from abdominal pain are easily soothed by gently rubbing their tummies with the oil. Mix all herbs in a bowl and then store them in a sealed glass jar away from sunlight. Prepare the tea as a hot infusion and drink 3-4 cups a day. St. John’s wort (Hypericum perforatum) is an easy plant to both grow and care for. It is a pretty little shrub with cheery yellow flowers that have a burst of long, showy stamen in the centre. The blossoms last from midsummer until autumn and they are followed by colourful berries. It makes an attractive ground cover and soil stabilizer. Once established, the plants need no care, and this makes them ideal for out-of-the-way locations.